Study abroad is an amazing experience that not only allows you to see beautiful countries, but it creates countless opportunities. The study abroad experience provides you with a world-class education, a chance to immerse yourself into new cultures, the opportunity to hone your language skills in a native land, growth through meaningful personal development, and of course to make life long friends through a one-of-a-kind adventure. There are many different study abroad opportunities at Bennett that our students can take advantage of. Through continued relationships with many universities ranging from Cyprus, Cuba, South Korea, Senegal, Tanzania, Pakistan, and China – Bennett provides a top-class experience for students with a passion for travelling the globe. Ready for your adventure? Apply to Study Abroad NOW! Choosing the right study abroad program can seem like a hard thing to do. Doing research on a country is a smart thing to do. Just don’t feel like you’re alone! There are many important factors that play into your decision: finances, eligibility, language barriers, career impact, etc. Don’t worry – we are here to help you make the right choice that will grow you as a person and as a scholar. Stop by our office to get help with narrowing down some of your choices. Students, please note: The Center for Global Studies does not provide internal scholarships, mini-grants, or funding of any kind at this time that pays for study abroad tuition, travel expenses, visas, or any other related cost. Financial aid is a possibility to pay for study abroad* opportunities for the Fall and Spring semesters. Financial aid can only be utilized to pay for study abroad opportunities that are credit-bearing, accredited, and in compliance with Financial Aid’s regulations. If you have any questions regarding study abroad session, please email me at kmallari@bennett.edu. *Study abroad is defined as a credit-bearing opportunity from an accredited institution abroad. Study abroad does NOT include internships, vacation trips abroad, volunteer trips, summer excursions, or research groups. If you are unsure whether your trip falls within these guidelines, please email us at studyabroad@bennett.edu for assistance. 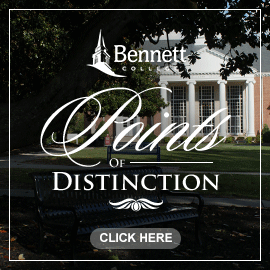 Students are eligible to receive financial aid (including loans, grants, and scholarships(if available) towards the cost of any study abroad program if the courses fulfill degree requirements and the student is taking the equivalent of a full-time course load at Bennett College. Full-time enrollment requirements are outlined by the Financial Aid Office. * Qualifying students typically receive a combination of loans and grants. * FAFSA should be completed as soon as available. * Student must submit documentation of approved trip from the Study Abroad Office prior to contacting the financial aid office. * Additional forms may be required, as communicated by the Financial Aid Office. Students, do not go to Financial Aid until you have approval for your study abroad trip. We get a lot of questions that are asked repeatedly so we wanted to make sure to address those ahead of time! Program costs differentiate on location, length of stay, and many other factors. Once you decide where you would like to go, narrowing down program prospects and figuring out the total program cost will be easy to do. Get started by coming by the Center for Global Studies, doing some research, and talking to your academic advisor. 3. How long are the programs? Conventional programs are usually for an entire semester or can be for the entire academic year. Short term programs are typically in the summer. 4. Can I use financial aid? Using financial aid for study abroad is a possibility, but there are requirements that the foreign institution must meet before the federal government will allow loan proceeds to be disbursed. Each program is unique; therefore, you will need to speak to a financial officer to get confirmation. 5. What documents do I need? *Did you know, we have a passport scholarship opportunity at Bennett?